Codubix® cranial bone prostheses are manufactured with knitting technique out of polypropylene and polyester yarn. 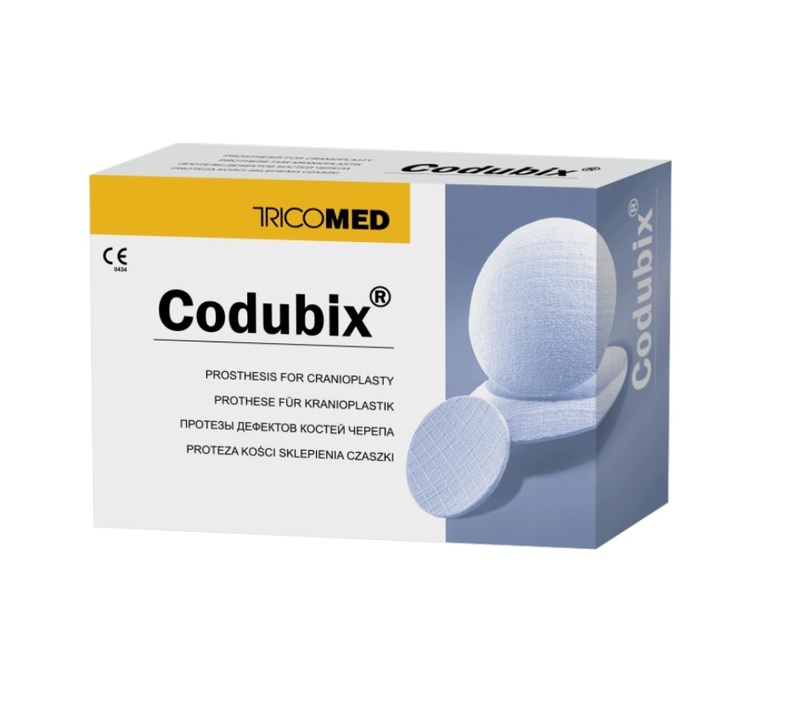 Codubix® medical implants used in cranial reconstructions combine all the best features of the biomaterials available on the market without their negative traits which may increase the risk of complications. The grafts are characterised by high biocompatibility owing to the combination of proven technologies used in manufacturing other biomaterials (e.g. vascular grafts). 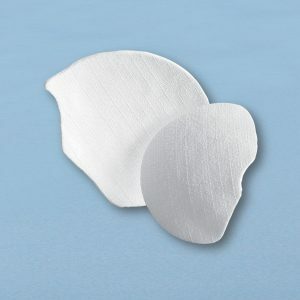 The implants present excellent immunological properties, high resistance to bending, low basis weight, thermal conductivity similar to that of natural bone and lack of liquid absorption (water, blood, etc.). They are chemically inactive and resistant to both high and low temperature. Despite their porosity, the grafts are resistant to infections and relatively susceptible to modelling during the implantation; they also allow diagnostics without giving artefacts. The Codubix® is easy to sterilise and does not cause local and systemic complications. The skull bone prosthesis is made of polypropylene and polyester yarn. The polypropylene yarn is characterised by low specific weight and low melting point (approx. 145°C) ensures the stiffness and hardness of the graft. The polyester yarn ensures appropriate flexibility and porosity which allow for relatively large unit contact area with the tissue which contributes to fast tissue overgrowth. The product is porous and has a non-uniform surface. The construction and nature of components allow to adjust the edges of the prosthesis using special scissors for cutting implants (bone forceps). 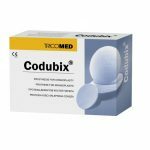 Codubix® 3D is a prosthesis upon individual order with preformed curve and contour. appropriate thermal conductivity – similar to the one of natural bone. 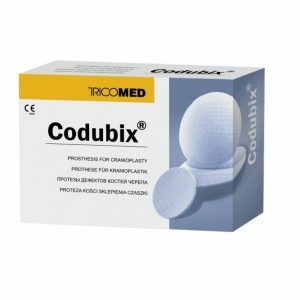 Codubix® and Codubix® 3D knitted cranial prostheses are intended for reconstructions of cranial bone defects in the skull cap. curvature in accordance with individual skull anatomy. Final choosing and adjustment of the graft takes place during the surgical procedure (the graft can be cut). The sterile bone prostheses are sterilised with moist heat in validated processes taking place in professional sterilisation devices - in acc. with the requirements of PN-EN ISO 17665-1. The product can be sterilised twice. The application of this technique to obtain a sterile product provides safety of the product because of the lack of potential harmful factors present in the sterilising medium. At the same time, it allows for obtaining sterile product which is ready for implantation. The steam sterilisation allows also for the immediate release of the product for sale without any additional period to wait – which is required during the sterilisation with ethylene oxide. For non-sterile products it is required to use a validated steam sterilisation technology under the conditions of 121°C for 20 min. According to the requirements of EN ISO 17665-1, the personnel involved in the steam sterilisation process has to possess appropriate qualifications for carrying out the steam sterilisation process. Microbiological purity determined in acc. with PN-EN ISO 11737-1; accepted limit: max. 100 microorganisms/1g of the device. Before the sterilisation process periodical tests of microbiologial purity of random-chosen products are carried out; such procedure guarantees full safety of use of the product. Codubix® grafts fulfil all the requirements specified in PN-EN ISO 10993-1 norm and they also posess a number of documented biological tests. pH of the sample – between 5,5 to 8,0 – determination of the pH of the sample is very important for the surrounding of the implantable product. Too high or too low pH may cause allergenic reaction or irritation at the site of implantation. Thickness – approx. 3,3 mm (both for standard and custom-made product) – similar to that of natural skull bone. Curvature height – from 8,6 to 24,0 mm (depending on the chosen size of the standard graft). Resistance to compression – from 6 to 10 daN (depending on the chosen size of the standard graft). Non-sterile Codubix® and Codubix®3D are packed in polyethylene bag on which TAG label is placed (identifyng the device). The implant can be seen through the package. Sterile Codubix® and Codubix® 3D are packed in double medical package (fulfilling PN-EN ISO 11607 requirements) - paper-foil bags adequate for steam sterilisation. On the outer packaging there is a TAG label (easy to peel-off, self-adhesive, identifying the device). The transparent package enables having a look into it and inspecting the device. The double package enables introducing the device into the operating room without losing its sterility; moreover, the transparent package enables having a look into it and inspecting the device. Both the non-sterile implant (the one in polyethylene bag) and the sterile one (packed ito double medical packaging with IFU and additional double TAG label) are placed in a cardboard box. Such package ensures safe storage within the guaranteed validity period. At present there are no other implantable devices which are available in two versions: a sterile and non-sterile on. The choice of the type of the implant may be influenced by surgeon's preferences or the complexity of the surgical procedure.